Upon entering the dimly lit, sparsely arranged gallery, I noticed a grainy video directly ahead. It showed surveillance footage of someone getting hit by a truck. Given constant media streaming of such things, I wasn’t particularly shocked until I found out who was in the accident. “That’s me on my way to my studio,” Aparicio told me. Across from the video, dead (taxidermied) birds encased in individual cement bricks were carefully arranged in rows on the gallery floor to form a small graveyard. “I found these birds dead outside of my studio window,” Aparicio said. “They speak to the hundreds of other dead birds I couldn’t take. We are used to seeing taxidermy show the animal as if they were alive, but I like to respect the position of death.” Each bird, like a frozen fossil in an open casket, was captured in a distinct resting pose, forcing us to consider their unique experience and valid existence. 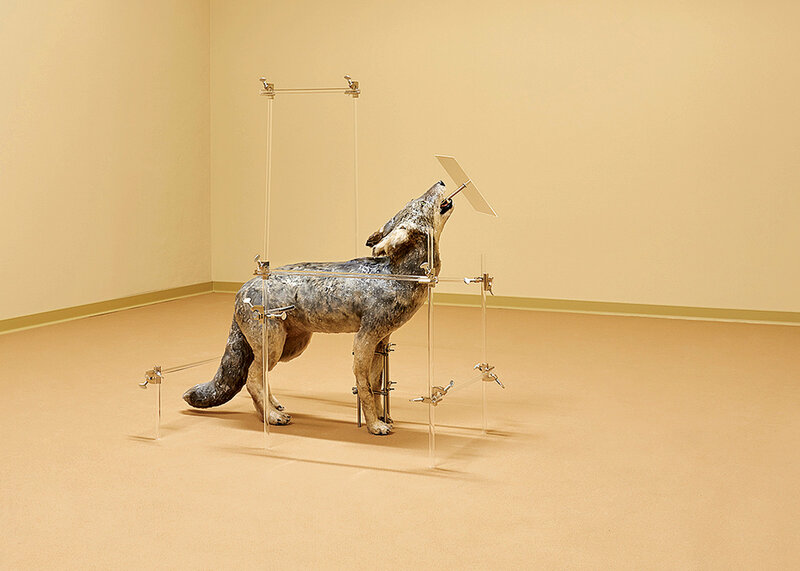 The piece draws from a growing trend of “rogue taxidermy”, defined by The Minnesota Association of Rogue Taxidermists as “a genre of pop-surrealist art characterized by mixed media sculptures containing conventional taxidermy materials that are used in an unconventional manner.” But while rogue taxidermy tends toward the extravagant (think bedazzled pigs and human-faced gazelles), Aparicio refuses to dress up death. Rather than feigning life or creating scenes for the re-imagined creatures to inhabit, she presents them as we find them: dead on the earth. She continues to thrust the viewer into her stripped down view of death by affixing a real bird’s heart and wing onto one of her minimalist paintings. Aparicio’s use of taxidermy in conjunction with her multidisciplinary practice and personal experience, questions our conception of life and examines the flawed relationship between nature and humankind. The birds’ cement, tomb-like enclosures function as a critique of human’s constant “improvement” and infringement on nature. And, while placing birds in their own individual graves honors their existence, it also reveals our indifference towards them, supported by the inherent absurdity in the very concept of a bird graveyard. Aparicio however does not let us forget that we, like our feathered friends, are fragile. The birds’ and Aparicio’s shared destination (her studio) and the imposing man-made aggressors (the studio window for the birds and the pickup truck for her) create a sympathetic connection between the artist, the subject matter, and the viewers. Still, Aparicio’s work does not ignore human arrogance. The display of the unadorned heart and wing boldly faces man’s aggression by mirroring as well as mocking hunting trophies. Making my way to the end of the exhibit, I found a wall affixed with numerous small glass jars, each enclosing a singular delicate dandelion tuft with a slender seed attached. By entombing the birds, brandishing a once-beating heart, capturing and displaying the dandelion trophies, and documenting her own vulnerability through her accident, Aparicio creates a respectful, all-encompassing definition of life: honoring its fragility and beauty as well as acknowledging man’s inevitable and superior imprint.